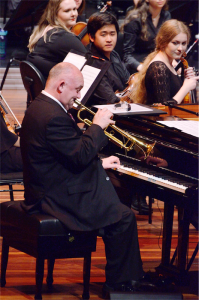 THE expressions on their faces said it all; the young musicians in the Canberra Youth Orchestra couldn’t believe they were on stage playing music with James Morrison, a living legend in Australian jazz. But, before the James Morrison Quartet came on, the 82-piece orchestra, including 17 CYO alumni, opened the concert with Gershwin’s programmatic “An American in Paris”. Just as the piece demands, the brass dominated, but a “tighter” overall ensemble sound would have created more of the sense of a busy, bustling Paris. The orchestra also opened the second half with a very lovely performance of Aaron Copland’s concert suite for his ballet “Appalachian Spring”, allowing the nice balance and sweet tone of the strings, led by concertmaster, Helena Popovic, to shine through. Principal clarinet, Sam Cass, beautifully introduced the seventh of the eight sections in the suite, the shaker tune “Simple Gifts”, itself inspiring “Lord of the Dance”. But, the strings, despite their numbers, and while nicely balanced and sweet as an ensemble, often were rather too sweet and, thus, lost when the orchestra is “tutti”. This was evident particularly in “An American in Paris” and in some of the jazz tunes played with the James Morrison Quartet. When the Quartet joined the orchestra, there was no holding back; these top-shelf jazz musicians did not make any concessions for the youthfulness of the orchestral musicians. In two sets of jazz standards, plus a Morrison samba original, “Enchanted”, they stretched the orchestra, which responded with confidence and agility. Conductor Leonard Weiss, ever attentive to the Quartet’s rhythms, improvisatory breaks, and spontaneity so typical of the jazz idiom, brought on the orchestra’s entries with precision. For the final two tunes, Morrison introduced his special guest and fellow jazz trumpeter, and Canberran, Zach Raffan. It was almost duelling trumpets as the two of them played off each other superbly in a pensive “My Funny Valentine” and the lively concert closer, “El Gato”, by Duke Ellington, stretching both trumpets well beyond their normal range. Another very pleasing aspect of this concert was that most of the jazz tunes were arranged or orchestrated by Australian musicians. 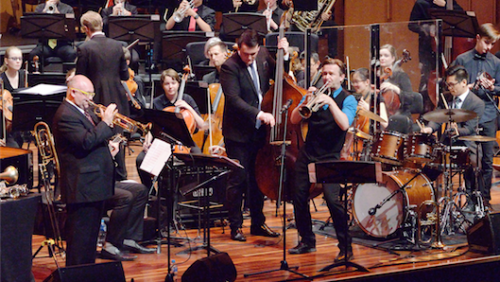 The writing of Sean O’Boyle, Joe Chindamo, Judy Bailey and Graeme Lyall all contributed to what was a highly entertaining and fitting celebration of the Canberra Youth Orchestra’s 50th birthday. It was James Morrison’s birthday, too. He was the same age as the orchestra, “plus GST”.